Try this alternative to your Friday night take-away. All you need is some naan bread to mop up the spicy sauce. 1. Heat the oil in a large casserole set over a high heat. Sear the beef in batches for 5 to 6 minutes, until browned. Transfer to a dish. 2. Add the onion to the casserole and sauté for 5 minutes, until softened. Add the garlic, chilli, curry paste, lime leaves, star anise and cinnamon stick. 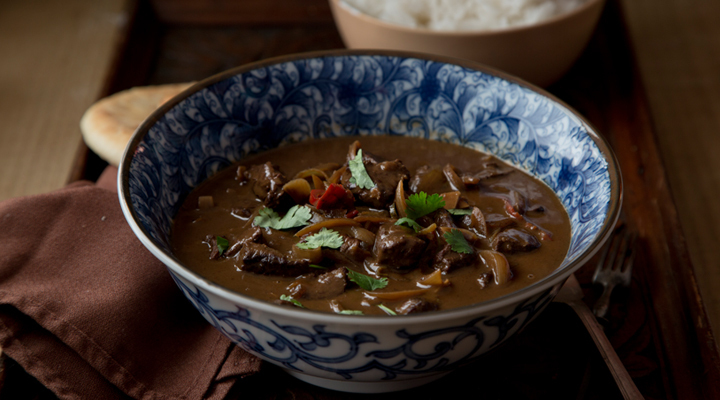 Cook for 30 seconds, then pour in the coconut milk, beef stock, fish sauce and treacle, if using, and bring to the boil. Add the beef pieces back to the casserole, cover with a lid and reduce the heat. Simmer for 1¾ hours, until the meat is meltingly tender and the liquid has reduced. Simmer for an extra 30 minutes without the lid on if needed. 3. Meanwhile, cook the jasmine rice as per the packet instructions. Keep warm. 4. Before serving, discard the lime leaves, star anise and cinnamon stick. Stir in the lime zest and juice and check the seasoning. 5. Serve with the warm jasmine rice and some naan bread on the side. Garnish with the chopped fresh coriander.